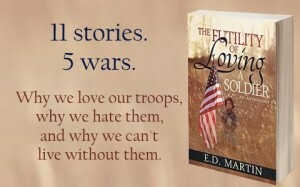 This month I’m posting excerpts from my short story collection The Futility of Loving a Soldier. This week is a continuation of Lindy’s story in “Crash.” She’s just returned from combat and her dad isn’t sure how to react. She stood up abruptly, and Bill took an involuntary step back. She’d always been small, but she’d lost weight since her return; her eyes stared out from dark sockets in a too-angular face, framed by limp hair. They caught something in his expression and narrowed, and she pushed past him and out of the room. A moment later, the front door slammed. Bill sighed. At least she’d left the house. Perfect description of someone suffering and the last sentence was totally great! At least she’d left the house… and now he had a whole new package of worries to deal with. Such pointed detail in the descriptions. Tough situation, I feel for both of them. Very well done excerpt!